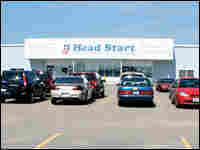 The Head Start Early Childhood Center in Hastings, Neb., is in a renovated Kmart buiding. According to Christensen, Hormel engineers told her that reusing a Kmart to house the company's homage to Spam in Austin, Minn., was less expensive than building a new space from the ground up. 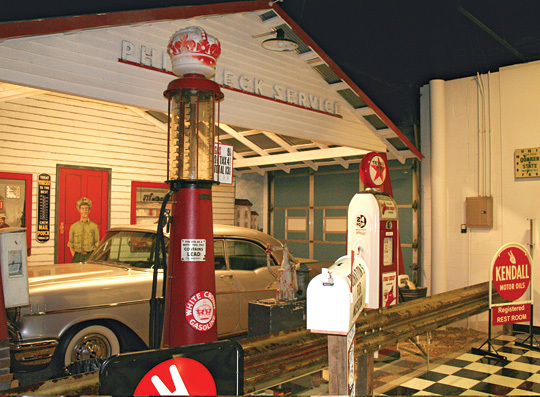 The garage door in the back of Route 66's gas station exhibit is an original from the building's days as a Kmart. 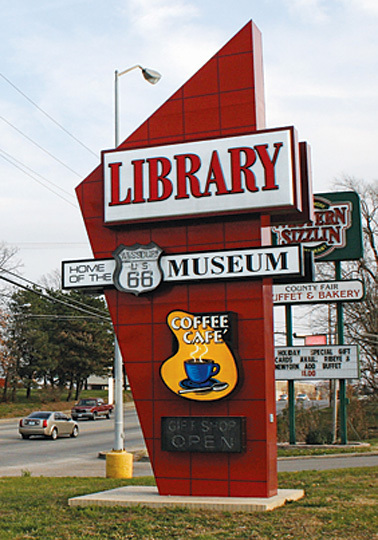 The library in Lebanon, Mo., shares space with a museum and a cafe in a building that used to be a Kmart. The asphalt was freshly laid when I first visited the RPM Indoor Raceway. The parking lot was sweating in the dead heat of a Texan July, and the soles of my tennis shoes fused slightly with the tar as I walked across it. Three acres of asphalt loomed in front of the building, reflecting all light and moisture right back up, so that a world of heat was hovering above the ground, right around my ankles. As we drove into the parking lot on that summer day in 2002, I first encountered the now familiar site of a reused Wal-Mart sign: those three tiers on a post that once announced "WAL-MART," "We Sell For Less," and "ALWAYS." 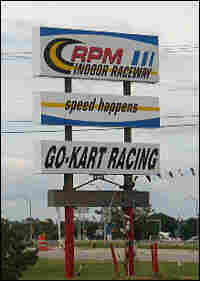 Now this sign read "RPM Indoor Raceway," "Speed Happens," and "Go-Kart Racing," a merging of the building's past life and its current incarnation. Driving down the highway or on a country road today, when I see that multitiered sign, I am clued in to the strip mall's hidden past—Wal-Mart once operated in that building. In some instances I wonder if the reuse of the signage is an adaptive reuse of Wal-Mart's branding, a strain of marketing that carries through from the building's past life, an obvious nod to Wal-Mart's legacy at the lot. Round Rock, Texas, is a town that was historically a suburb of Austin. By 2002, when I first visited, the suburb had grown so that it was no longer "sub" anything: in 1990, the U.S. Census listed the population at 30,923; as of June 2006, the population was at 86,902; the 2006 Annual Report of the city projects a 2010 population of over 100,000 people. Comprehensive Planning Award from the Texan chapter of the American Planning Association in 1999, and the city website boasts about its long-term plan for expansion. Round Rock is characterized by its strip malls, big box stores, and overpasses arching against the sky, which apparently have all been carefully planned. The old Wal-Mart building is on a road called Hester's Crossing, a name that stands out among the surrounding road names, all of which consist mainly of numbers. "Hester's Crossing," a street name that is surely a relic of some forgotten use of the surrounding land, is now home to several big boxes. The building is directly accessible from Interstate 35, so that the Austinites nearby had easy access to the Wal-Mart store when it was in operation. This big box was first constructed decades ago, and at the time, it sat out on its own, away from all other development. The aerial photographs of the building site at the time of construction, in the early 1980s, show that the building was indeed a cement and steel island in a sea of yellow grass. "The aerial photograph shows no other commercial development in the frame of the picture," says Charlie Gifford, owner of the racetrack. 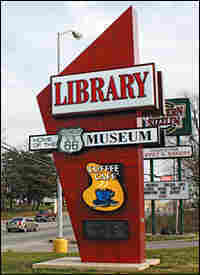 Slowly, stores moved nearby, just as had been the case in Bardstown. The Wal-Mart building attracted other nearby businesses, helping build Round Rock into a commercial center, drawing heavy traffic from the surrounding region. 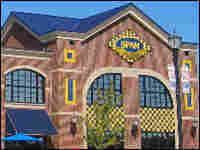 My first visit to the RPM Indoor Raceway was in the summer of 2002. As my tour guide, Austin resident Jacqueline Saltsman, drove me north from Austin, I noticed a definite break in the continuity of the sprawl. There was a distinction in the roadside landscape between the city of Austin and the city of Round Rock, a break in the commercial development lining the highways. As we drove, we passed a few stray highway exits that led to seemingly residential districts, but there was indeed space lining the highway; the land was not yet entirely consumed by the impending sprawl. During a second visit to the site in 2006, only four years later, the drive from Austin to Round Rock offered a seamless continuation of development, so that the Round Rock exit signs snuck right up on me on Interstate 35 while I still thought I was in Austin. 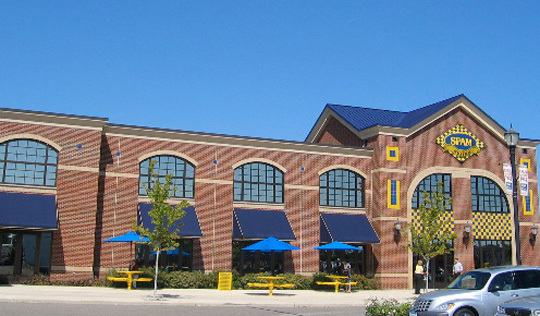 My second visit to the site occurred when I was summoned to investigate a compelling update: The racetrack had been evicted from said building, and the structure had been broken into a strip mall hosting a Gold's Gym, a smoothie shop, a health food store, a men's hair salon, and a tanning salon. In the words of Gifford, "The evolution of that big box property from vacant land, to Wal-Mart, to the RPM Indoor Raceway, to Gold's Gym, is indicative of the evolution that has taken place in the last decade in the greater Austin and Round Rock area." 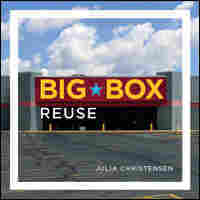 Excerpted from Big Box Reuse by Julia Christensen, published by The MIT Press, November 2008. 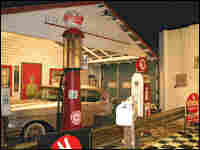 Copyright 2008 Massachusetts Institute of Technology. All rights reserved.